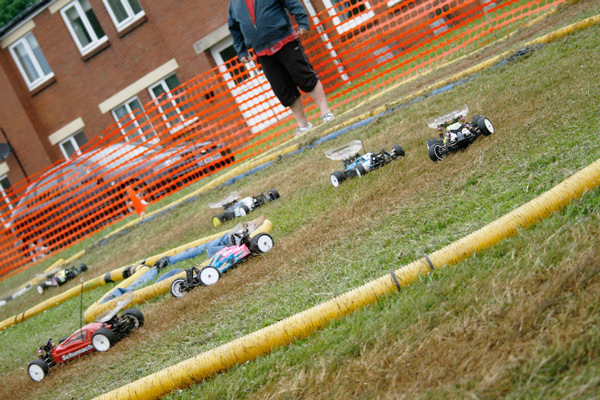 Sadly we don’t have a permanent outdoor facility, so once a year when the club hosts a round of the WRCA regional championship, a regional competition that feeds into the national BRCA license grading system for the 1/10th offroad class, we set up an old skool grass track out on the lawn on the front of the centre, and the best drivers from all over Wales compete. We are always on the look out for opportunities to set up our own permanent outdoor track, and fingers crossed one day we can find something/somewhere suitable. Currently our members make use of a number of other tracks in the area for this, namely COBRA in Cardiff, GNR in Cwmbran and WORM in Weston-super-Mare, who all run regularly and crucially at different times to us! At least with indoor racing the weather never stops us racing though, and we can run indoors all year around too. We do our best to make our indoor tracks offroad though, so it’s about as close to outdoor racing as you’ll find without actually being outdoors!